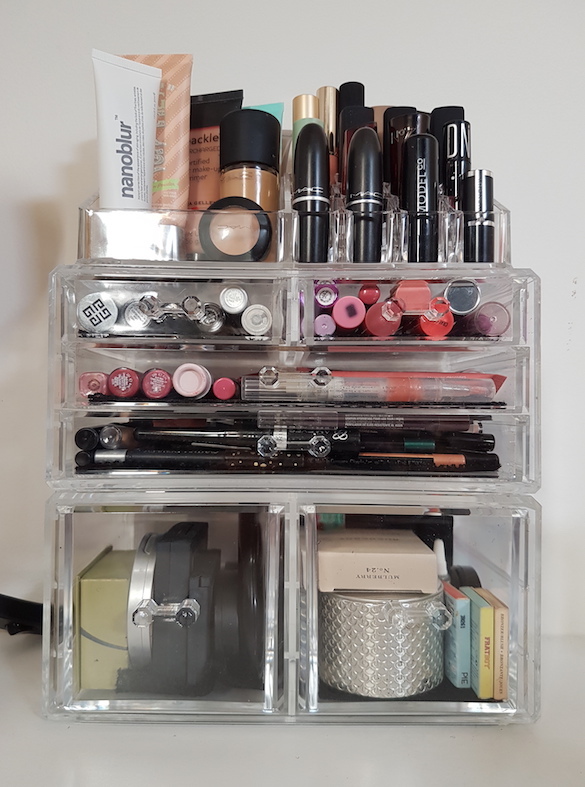 Like I stated in the intro, the cosmetics organiser that I chose is a 22 compartment organiser. However, it is also available in a 24 section option. The difference is that one of the big, deep drawers at the bottom are instead replaced by a set of three thinner drawers, but they still fit within the space that the one drawer takes up. You can organise the layers however you like, and you can also purchase more sections to layer onto it if you wish. 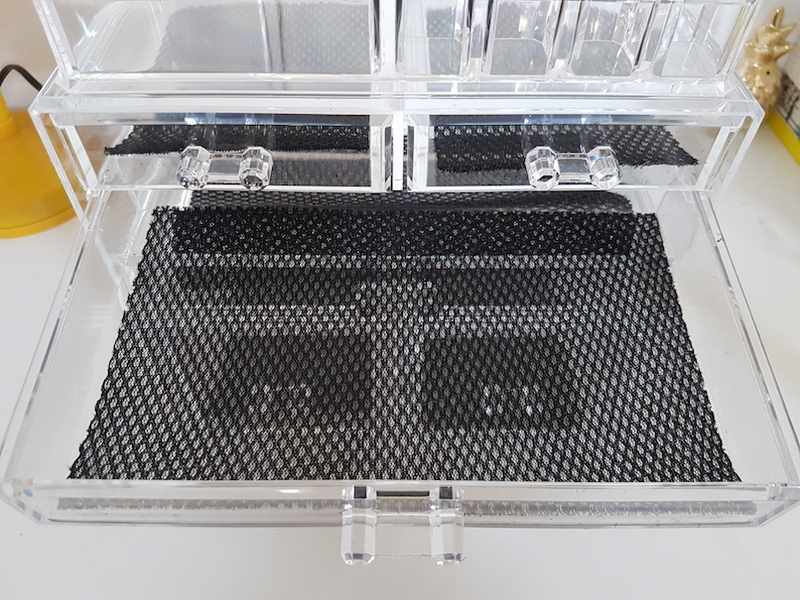 The organiser sections fit together nicely and it was easy to set up, so it is simply a case of removing it from the packaging, sitting the sections on top of each other and away you go. 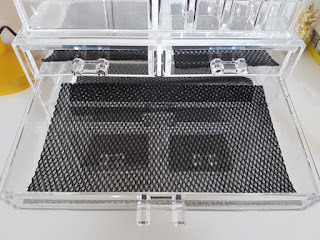 Each of the drawers also contain a sheet of black fabric at the bottom to line them. I'm not 100% on the purpose, but I do like it. 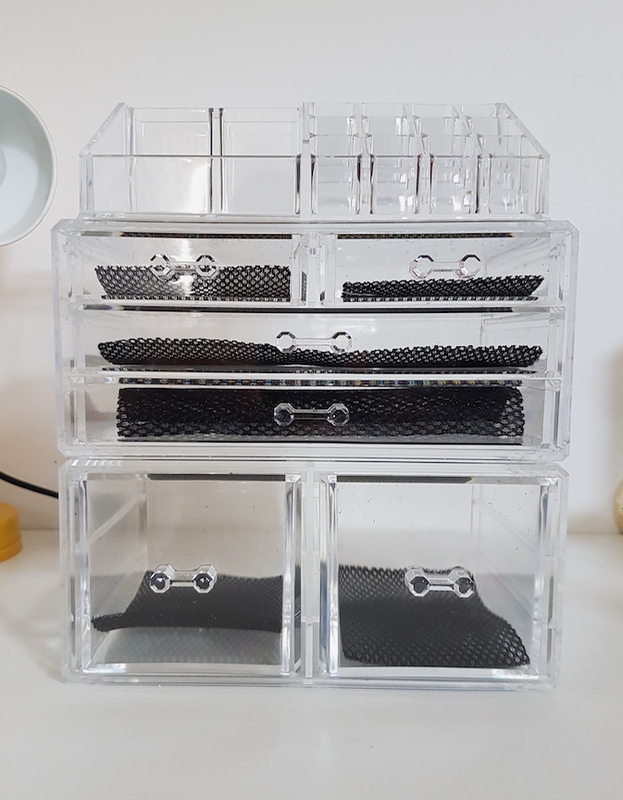 The organiser contains a mini drawer set (middle section) that contains two smaller drawers and two wider drawers underneath. 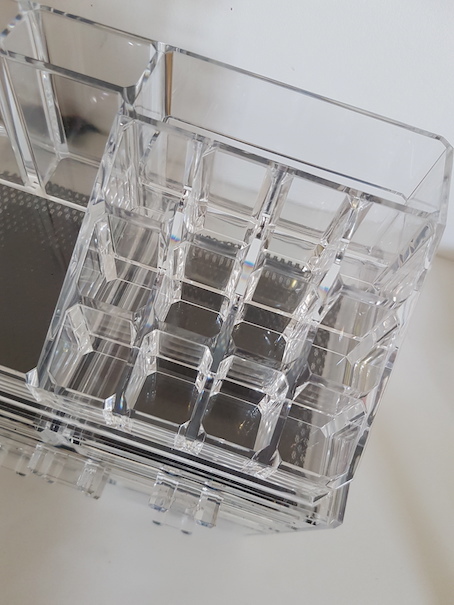 It also contains a drawer duo (bottom section) that has two deeper square drawers and for the top there is a tray that contains a whole bunch of sections for things such as lipsticks, pencils, brushes, foundations, primers etc. 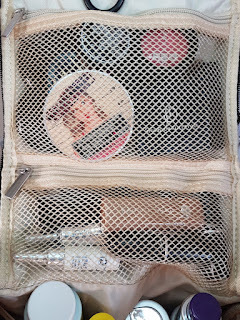 The thin drawers are better suited to your eye and lip products. Think pencils and small tubes rather than palettes, though. I can't fit all of my lip products into the drawers, so I do keep a lot where I used to store them too. I can fit all of my eyeliners and mascaras into the wider drawers on the organiser, but not any of my eyeshadows or palettes, so they stay stored in their previous spot too. For the main items I use daily though? Yes. They all fit. Because of that, I can fly through my daily routine with ease due to everything being perfectly organised and accessible on my desk and save lesser used items in their old spot for less frequent use when I have more time. For people who want to streamline your routine, organisation is always handy, and this is a great organisational tool. The bag comes with a lot of space and a lot of sections to hold different products in place. You should be able to fit all of your essentials - toothbrush, toothpaste, cleanser, toner, moisturiser, night routine, body care etc. - as well as makeup. 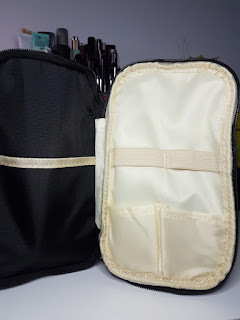 In addition to what's inside, the outside also has a small hook that enables you to simply hang the bag up wherever you choose, such as a bathroom or a wardrobe or wherever. This is particularly useful because instead of arriving at your destination and having to remove everything and organise it from a bag, you can simply hang it up, unzip it and then use the bag like its own organised shelf or something. You can use your items, put them back when done, and then when you're ready to leave, you just have to zip it all up and go without having to re-pack the whole thing. I didn't put my entire routine in there, instead just looking for different sized bottles and shapes to see what could fit. 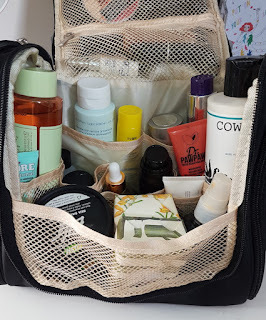 Because of this, if you were to add your own regular routine into the bag, it may look entirely different (as it would if I did with mine) due to the differing average-sized bottles for different types of skincare/bodycare items (I'd imagine if you were travelling that you may use some travel sized items and facial skincare items tend to be smaller in size but greater in number to body care products, for example). If you were to take a reasonable amount of stuff, the hanger is more than sufficient to hold your filled bag easily. With a lot of stuff in it though like I showed above, there is a noticeable strain on the small hanger that I imagine becoming more of an issue the longer you leave it hanging with a heavy load. I did have a slight issue with the zips on the sections at the top. They were somewhat apart whilst they were supposed to be done up, like they were broken, when I first opened the bag. I unzipped them and zipped them back up again and I haven't had the issue since. 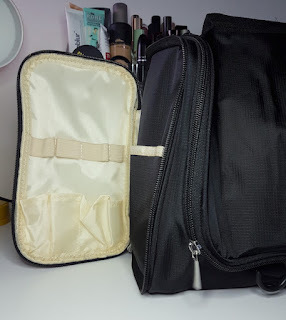 I'm not sure if it was because it hadn't yet been used, but even with the pockets filled up with products to the point where it was hard to zip the pockets up, the zips never broke open again. It isn't too bulky to carry around and it isn't too large in size to overwhelm a suitcase if you prefer to pack it into there instead of carrying it. 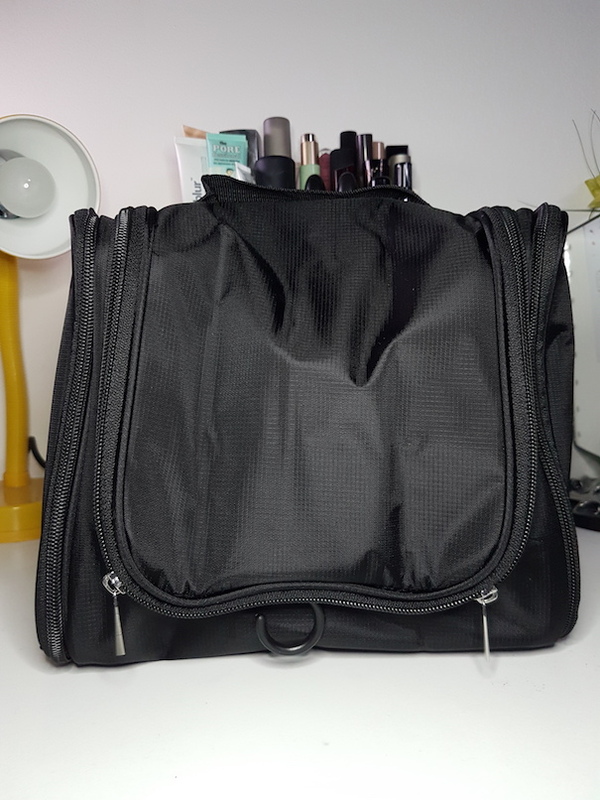 Logistically, this bag will be a godsend to the beauty fans who love to take along the bulk of their collections as well as being a practical item for families when they travel too. Overall, I'm really thrilled with both of these organisers. 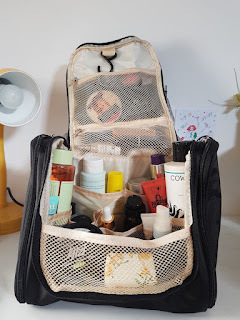 I managed to fit rather a lot into both the Cosmetics Organiser and the Travel Toiletry Bag. If you have a smaller collection, this organiser will definitely be enough to fit everything into. If you are a fan of palettes, you may struggle a tad to fit many (or any) into it, so do keep that in mind when thinking of what you will want to use it for. The organiser has also been helping me a lot for easier access to my everyday items. The transparency of the organiser makes it super easy to find everything you need without having to open drawers to have a rummage around. It also gives you an opportunity to showcase all of those beautiful items you've purchased rather than hiding them! 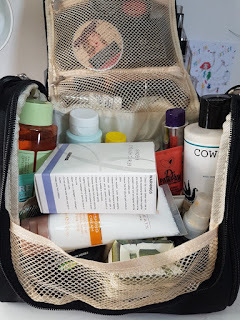 In regards to the bag, I'm such a pain in the bum when travelling with all of my beauty products, so this bag is truly going to be a huge help, that is for sure. You can purchase the Three Layer Cosmetic Organiser and the Travel Toiletry Bag from Amazon. 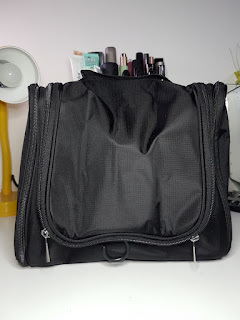 What are your thoughts on the organiser and travel bag? Would you find them helpful?